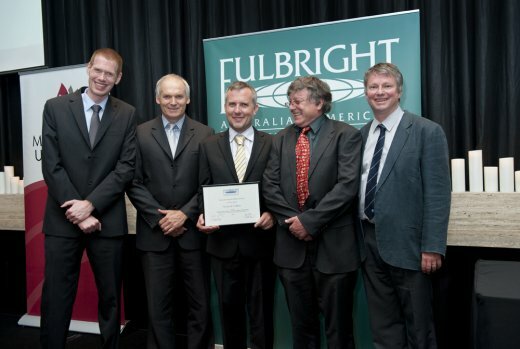 Congratulations to Dr. Richard Collins on being named the 2012 Australian-American Fulbright Senior Scholar in Nuclear Science and Technology. Through this program, Collins is collaborating on geochemical research at Pacific Northwest National Laboratory. This connection is key to the Australian-American Fulbright program. The program, started in 1949, furthers understanding between the two nations through educational and cultural exchanges. Australia's Fulbright Scholar in Nuclear Science and Technology is a recent addition to the program. An Australian Research Council Future Fellow with the University of New South Wales, Collins is spending 6 months at PNNL exploring uranium's acceptance and donation of electrons. Working with Dr. Kevin Rosso at PNNL, Collins is building computational models to explore uranium's electron transfer processes with iron, the most important redox-sensitive trace element in the environment. The dynamics of electron flow between these two elements significantly alters the mobility of uranium-based molecules and improved understanding of these processes will make uranium mining and cleanup easier.